Percutaneous transhepatic cholangiographic image of Caroli disease. During catheter placement, contrast material previously injected outlines the irregular, dilated saccular ductal branches. Caroli disease. CT image in a patient with biliary dilatation. Drawing shows the main right hepatic duct and the multiple segmental branch dilatations related to Caroli disease. Note the saccular dilatations that can occur, involving the right lobe of liver in this case. Caroli disease also is known as communicating cavernous ectasia or congenital cystic dilatation of the intrahepatic biliary tree. It is distinct from other diseases that cause ductal dilatation caused by obstruction. It is not one of the many choledochal cyst derivatives. Imaging studies play a major role in the diagnosis of Caroli disease. [1, 2, 3, 4, 5, 6] Ultrasonography is widely available and is often used first in the diagnosis of any process involving the liver; therefore, it is commonly performed early in the workup of patients with Caroli disease. Demonstration of the continuity of the cystic lesions with the bile ducts is paramount in diagnosis. Nuclear scintigraphy also may be performed in the initial workup and can be valuable in excluding obstructive causes for intrahepatic duct dilatation that are depicted on cross-sectional images. Computed tomography (CT) scanning is excellent for screening patients, and magnetic resonance imaging (MRI) can aid in the diagnosis of Caroli disease. Also, MR cholangiopancreatography (MRCP) can be performed, and images show ductal anatomy well, with additional techniques. Endoscopic retrograde cholangiopancreatography (ERCP, shown below) can be performed in patients with Caroli disease and can aid in diagnosis. Biliary interventions also can be performed, but the intrahepatic ducts can be difficult to access. Caroli disease. Endoscopic retrograde cholangiopancreatographic images obtained during stone removal from the hepatic ducts. The patient is prone. Caroli disease. Contrast-enhanced percutaneous transhepatic cholangiographic image shows the dilated ducts in the left lobe of the liver. Caroli disease. 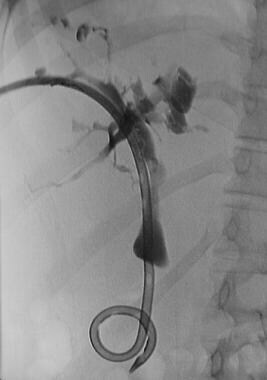 Image obtained after percutaneous transhepatic cholangiography shows the percutaneous biliary drainage tube in place. Laboratory examinations also are important and include bilirubin level analysis and liver function testing. Elevated white blood cell counts indicate infection, possibly cholangitis. Cultures of the blood, if findings are positive, support a diagnosis of sepsis. 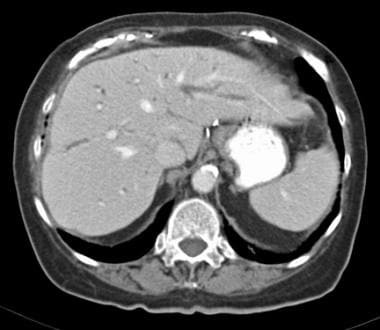 Biopsy of solid liver masses may be performed to aid in the diagnosis of cholangiocarcinoma. Congenital hepatic fibrosis must be diagnosed at histologic examination; this diagnosis can help exclude cirrhosis. Ultrasonography can be limited by air in the adjacent bowel. The many reasons for false-positive scintigraphic results are well known, and if biliary obstruction from a complicating factor is present, nuclear scans may be nondiagnostic. Artifact can affect CT scans. Not all patients can receive iodinated intravenous (IV) contrast. ERCP and PTC are invasive. ERCP cannot be performed if a gastric outlet obstruction or a previous surgical anastomosis (eg, gastrojejunostomy) cannot be crossed. PTC can be difficult if the peripheral ducts are not dilated, or PTC may be contraindicated if the patient has a severe allergy to radiographic contrast media or an uncorrected coagulopathy. MRI and MRCP can be hampered by artifact, as well as by such patient factors as claustrophobia or excessive weight. 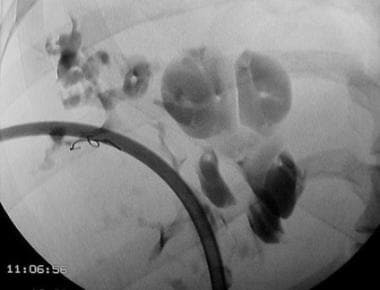 The most common, and often the first, interventional radiologic procedure is PTC, which reveals dilated segmental intrahepatic biliary radicles. 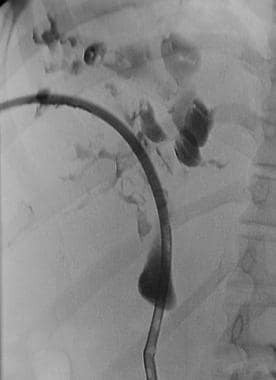 Drainage procedures with ERCP or PTC are important, and sphincterotomy can aid biliary drainage and stone removal or subsequent passage and may decrease bouts of cholangitis. ERCP reveals dilated segmental intrahepatic biliary radicles. With PTC or ERCP, the diagnosis can be made with a high degree of confidence when the large intrahepatic branches have focal or segmental involvement with cystic outpouchings in which the contrast medium collects. False-positive findings are rare with these techniques, and false-negative findings are related to poor filling in the dilated ducts (especially possible with ERCP). 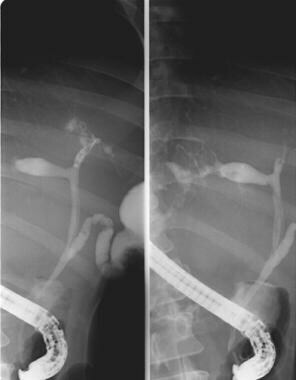 Plain abdominal radiographs are not helpful unless hepatic calculi are found. Barium examinations are not indicated. Traditional IV or oral cholangiography is not beneficial. However, ERCP is helpful. Dilated segmental intrahepatic biliary radicles are present without involvement of the extrahepatic biliary tree. Preinfused scans may show hyperattenuating sludge and stones or debris. 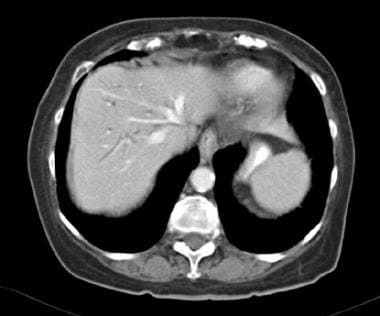 Complications such as cholangitis, choledocholithiasis, or cholangiocarcinoma may be present and can be identified with CT imaging. Portal hypertension can be present and result in hepatosplenomegaly with varices. Contrast-enhanced images obtained through the kidneys can show associated multiple renal cysts. 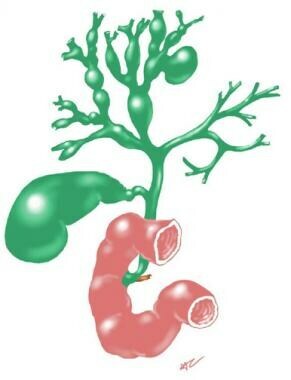 The diagnosis can be made confidently if irregular cystic lesions communicate with the dilated biliary tree. No obstruction is present without the usual peripheral tapering of intrahepatic ducts on the opposite side that extend from dilated central ducts and the dilated extrahepatic biliary tree. Liver cysts are round. False-positive findings are unusual. Bilobar dilatation of the intrahepatic ducts from causes other than Caroli disease mimics obstruction and does not have the superior liver predominance characteristic of Caroli disease. Artifact can cause false-negative findings. False-positive findings can occur with other cystic or cystlike lesions. Artifact can limit the evaluation and cause false-negative results. Ultrasonography is currently the examination of choice. Dilated segmental intrahepatic biliary radicles are easily detected. No obstruction is present. The cystlike tubular anechoic spaces converge toward the porta hepatis. They are largest in the superior part of the liver. The intraluminal portal vein sign is related to the protrusion of the portal vein branches into the cyst wall. Color flow Doppler ultrasonography is helpful in showing blood flow in these branches but no flow is present in the bile-containing spaces. Portal branches bridge the cyst walls. Ultrasonography can also help in the diagnosis of complications and in the follow-up of patients with Caroli disease. Intraductal calculi are echogenic with acoustic shadowing. Ultrasonography-guided needle aspiration of bile from the cystlike lesions may be beneficial in the diagnosis of cholangitis and in confirming that the cysts communicate with the biliary tree. Congenital hepatic fibrosis in Caroli syndrome may be diagnosed with ultrasonograms that show abnormal liver echogenicity. Ultrasonography-guided core biopsy may be performed, if necessary, to obtain liver samples for histologic evaluation to confirm this condition. In addition, polycystic renal disease, which is associated with Caroli disease, can be confirmed with ultrasonography. Ultrasonography is an excellent tool. A positive result has good predictive value and permits diagnosis with a high level of confidence. Caroli disease is the only condition in which dilated ducts surround the portal radicles; this finding at ultrasonography may obviate other invasive diagnostic techniques. Few variants affect diagnosis with ultrasonography. Choledochal cyst or other cystic diseases, including congenital or acquired cystic masses, may cause false-positive findings. These structures do not communicate with the biliary tree. False-negative results occur if the liver is not fully evaluated. Hepatobiliary scintigraphy with technetium-99m iminodiacetic acid (99m Tc IDA) agents reveals large, irregular, multifocal collections of the radiotracer in the liver. A beaded appearance in the dilated ducts, if present, is somewhat pathognomonic. These collections correspond to the segmental dilatations, and no extrahepatic obstruction is present, although bile stasis and stone formation may result in atypical obstruction. On early images, if the ducts are dilated enough, they appear as photopenic branching areas within the liver. Single photon emission CT (SPECT) scanning may better outline the ductal pattern but it is most helpful in the evaluation of focal disease. The confidence level is moderate to high when focal or segmental involvement is present in the large intrahepatic branches without obstruction. Overall, scintigraphy is not helpful compared with cross-sectional imaging techniques. False-positive findings may be related to other cystic lesions of the biliary tree. False-negative findings are related to problems with the technique. Cholangitis can impair hepatic uptake of radiotracers. Obstruction related to stones or debris from the ducts may cause misdiagnosis. Venkatanarasimha N, Thomas R, Armstrong EM, Shirley JF, Fox BM, Jackson SA. Imaging features of ductal plate malformations in adults. Clin Radiol. 2011 Nov. 66 (11):1086-93. [Medline]. Levy AD, Rohrmann CA Jr, Murakata LA, Lonergan GJ. Caroli's disease: radiologic spectrum with pathologic correlation. AJR Am J Roentgenol. 2002 Oct. 179(4):1053-7. [Medline]. [Full Text]. Wang ZX, Li YG, Wang RL, Li YW, Li ZY, Wang LF, et al. Clinical classification of Caroli's disease: an analysis of 30 patients. HPB (Oxford). 2015 Mar. 17 (3):278-83. [Medline]. Asselah T, Ernst O, Sergent G. Caroli''s disease: a magnetic resonance cholangiopancreatography diagnosis. Am J Gastroenterol. 1998 Jan. 93(1):109-10. [Medline]. Guy F, Cognet F, Dranssart M, Cercueil JP, Conciatori L, Krausé D. Caroli's disease: magnetic resonance imaging features. Eur Radiol. 2002 Nov. 12(11):2730-6. [Medline]. Lefere M, Thijs M, De Hertogh G, Verslype C, Laleman W, Vanbeckevoort D, et al. Caroli disease: review of eight cases with emphasis on magnetic resonance imaging features. Eur J Gastroenterol Hepatol. 2011 Jul. 23 (7):578-85. [Medline]. Moslim MA, Gunasekaran G, Vogt D, Cruise M, Morris-Stiff G. Surgical Management of Caroli's Disease: Single Center Experience and Review of the Literature. J Gastrointest Surg. 2015 Nov. 19 (11):2019-27. [Medline].